Working Concepts 1012 Soft Knees, Disposable Knee Pads 12 / PAIRWorking Concepts, Soft Knees, Disposable Knee Pads, Item # 1012, Simply peel the backing off the knee pad and stick on the garment. The knee pads can be used several times or thrown away with disposable garments when finished. Soft Knees Disposable Knee Pads were originally designed for use with disposable Tyvek coveralls but also work great with jeans and work pants (provided they are clean when the pads are first installed). Simply peel the backing off the knee pad and stick on the garment. The knee pads can be used several times or thrown away with disposable garments when finished. 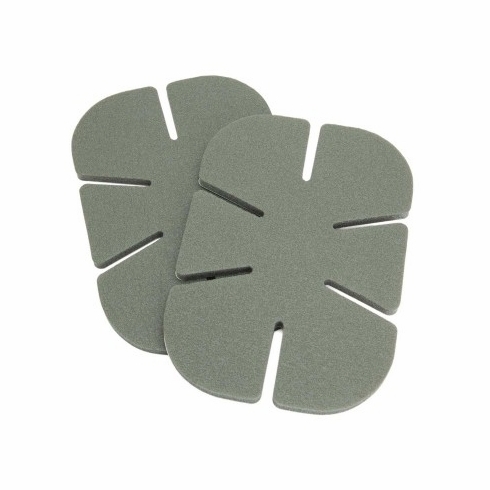 The wonderful part about using these pads is they are strapless so they do not cut into the back of your knee. They can be worn inside or outside garments and even stuck on surfaces (elbows, flooring, walls, etc.) where extra padding is needed. Protect your knees and the integrity of your protective garments while increasing the length of time on the job because it absorbs shock and cushions the knee. Great for protecting workers in rough conditions and ideal for waste disposal, HazMat and cleanroom use. Made in the USA by Working Concepts.